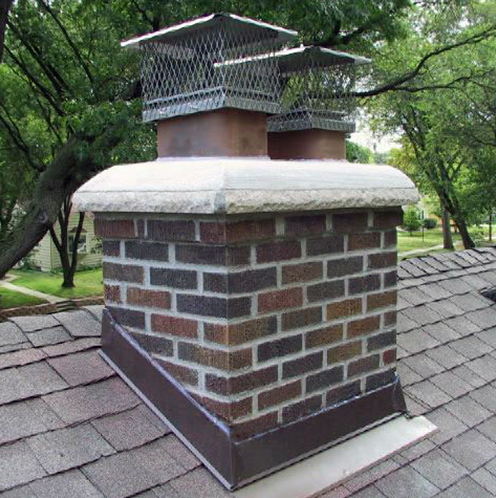 Chimney Cap Repair Minneapolis/St. Paul MN | Dayco General Inc.
Chimneys typically display deterioration from the top down. The concrete cap at the very top of the chimney serves to protect the composite structure below. On a masonry chimney, the concrete chimney cap is quite commonly the first component of a chimney to fail. Dayco General routinely performs concrete chimney cap repair in the Minneapolis / St. Paul, MN area. A properly maintained chimney cap can save a property owner significant expense in staying ahead of their masonry chimney repair needs. Once the concrete cap begins to crack and experience a general deterioration due to age, water starts to penetrate the structure’s interior. As this occurs, moisture is wicked into the interior surfaces of the composite masonry immediately below the chimney cap. In the world of brick manufacturers this wicking is known as “absorption” and each brick comes with an absorption rating. Almost all modern brick have a very low absorption rating, but all this is overcome by simple ageing with repeated contact by water. When chimney top repair is neglected, it leads to water getting to the brick and mortar from the inside as well as the outside. This situation can develop into a costly problem for chimneys in the Twin Cities metro area because our climate comes with extreme freeze/thaw conditions and saturated brick and mortar do not fare well in this environment. Every time the brick and mortar on a chimney become saturated, especially when it is getting wet from both sides, and then freezes it expands the material very slightly. Each time a masonry structure freezes with sufficient water content, microscopic damage occurs. Over time the absorption rate begins to rise as the freeze/thaw process expands the original volume of the masonry. Over many years the absorption rate becomes increasingly higher. We’ve heard from home owners who say “the chimney always seemed fine, then all of a sudden in the last year or so the brick faces started to pop off”. What they may not have realized is that the process causing the brick failure was a long time in the making and only when the expansion began to reach a critical stage did the damage become evident to the untrained eye. The whole function of a concrete chimney cap is to displace water away from the chimney’s interior. When the cap is allowed to degenerate to the point that it is allowing damaging water to enter, then that is the time to get in touch with the chimney repair contractors for Minneapolis and St. Paul at Dayco General.